Hello! I’m KingJamaa, and today I’ll be showcasing four wonderful masterpieces. How about we get started? 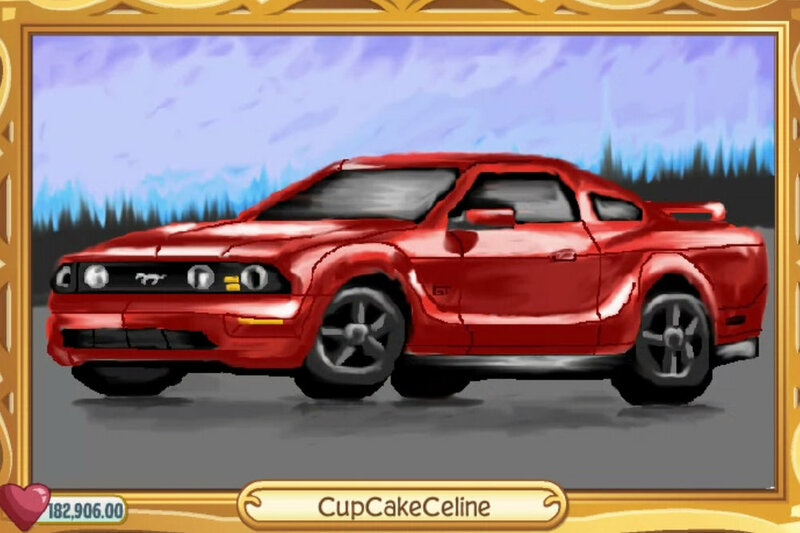 CupCakeCeline’s car masterpiece really took my breath away. The highlights and choice of color are amazing, as well as the overall shape of the vehicle itself. Next up, we have doglil’s piece of cherry blossoms. I adore the hues used, and the bridge ties the work together. 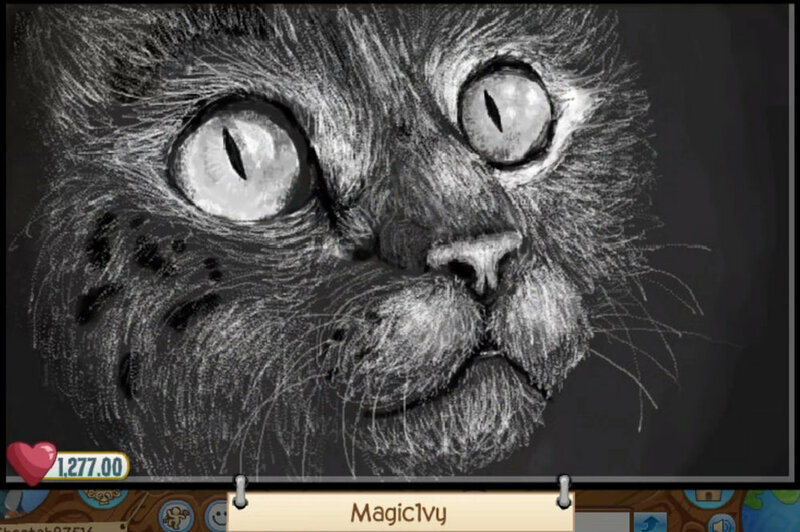 Thirdly, we have Magic1vy’s realistic cat art. The small brush strokes are wonderful, and the anatomy is great! FInally, we have Gundisalvus’ piece of Sans from the game Undertale. The skeleton’s cartoonish shape is very pleasing, and the swirl is so well done. Awesome job! Anyways, that’ll be it for it. here. Have an awesome week, everybody! Hey! I’m KingJamaa, and today I’ll be presenting you the ninteenth edition of Masterpiece Monday. How’s about we get started? Starbeing has created an amazing human art piece. I love the detailing, and even shading is glorious as well. The background also gives an interesting vibe to the work. Our next piece is made by Squidgirl23. I love the lineless style, and the colors are very similar to Julian’s horse which I enjoy. tigernations’ sunset masterpiece is phenomenally awesome. The blending is so cool, and the shades are brilliant. Finally, Artymis’ cloud piece is fantastic. The colors they used are amazing, and the shading is gorgeous. Anyways, that’s it for today. I’ll see you all next week! Hey there, Jammers! Welcome to the eighteenth edition of Masterpiece Monday. I hope you’re having a great day, and maybe it’ll get even better upon viewing these gorgeous masterpieces. 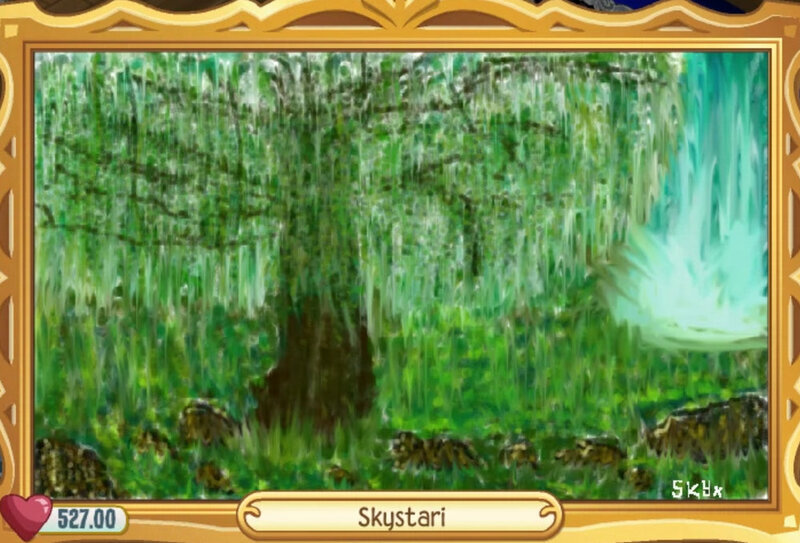 Our first piece is drawn by Skystari. I love the colors they used, and he blending is amazingly done. Additionally, I love the use of the smudge tool! starandyou has made our second piece of the week. I adore the lineart, and the colors are so pleasing. 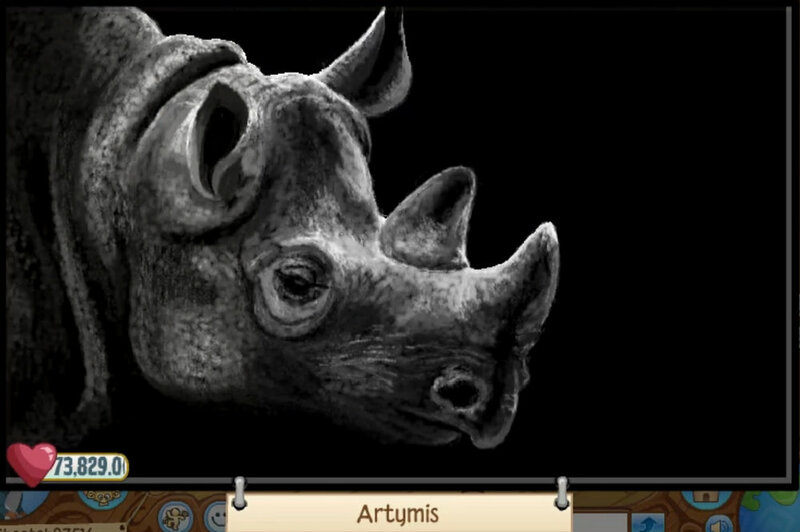 Artymis never fails to impress, especially with this rhino artwork. The dark colors mixed with the bright whites and grays really pays off, and the anatomy is phenomenal. Finally, 5weetpeas’ border collie art really caught my eye. The colors used are gorgeous, and the way the piece is put together is awesome. Anyways, that’ll be it for this week. I’ll see you next time, and play wild! Salutations, Jammers! I’m King, and today I’ll be showcasing four different masterpieces. How about we get started? Our first piece is made by Pleasenosuddenmoves. I adore this masterpiece not only because it’s of a member of my favorite band, but it’s gorgeously done! I love the detail on Tyler’s skin, and his glassed are well made- especially the glare! Additionally, the anatomy amd shading is awesome for this monochrome piece. Masternibblenugetts has made an adorable cat masterpiece. The effects on this are gorgeous, and the blending is fantastic! I love the background as well, the colors go so nicely together! All in all, this is a very well-done piece. Next up, we have a wonderful scenery piece by tigernations! I absolutely love how the colors are used, though the palette is so pleasing. With the limitations of the AJ paint studio, this artist certainly did a great job! Last but not least brings us Creativelight’s anthropomorphic raccoon artwork! The Golden lineart makes the character pop, and the white background has the same affect on the piece. Finally, the items are so well done ame this artist has an amazing style! Well, that’s it for today. I’ll see you next week, and be sure to play wild! Salutations, Jammers! I’m King, and I’ll be producing the sixteenth week of Masterpiece Monday. cottonball43520 has created our first piece for today. The rabbit is adorable, and the gradient background is lovely. In addition, I adore the shading! ELeeney’s masterpiece of Nick Wilde from Zootopia really caught my attention. I love the offset green background, and the fur colors are very close to the movie’s shades. In addition, I love the effect of the black lineart! Thirdly, we have Toxicmedow4601’s Sir Gilbert piece. In general, this artist is very talented, and this masterpiece doesn’t fail to show that. The detailing and shading is amazing, and he realism is spontaneous. Last but not least is Galactakirby’s adorable pixel artwork of the video game character Kirby. The piece’s simplicity really makes a difference, and the cel-shading and pastel colors are phenomenal. If you’d like to see your piece here, don’t be afraid to shoot us an email at support@animaljamarchives.com with the subject line Masterpiece Monday Submission! Anyways, that’s it for this week. Play wild! Salutations! I’m KingJamaa, and today I’m presenting you the fifteenth edition of Masterpiece Monday. Let’s get started, shall we? astroverse has created our first masterpiece this week. I love the shading and lines, and additionally the numbere im the background give some color to the piece. Secondly, we have Lunicy’s gorgeous artwork. I love how they drew the figure, and the background and colors really blend well together. Amazing job! Up next is a stunning piece by wolfqt. The red color palette is awesome, and the use of multiple different shades really pays off in this art. Last but not least is linga’s awesome realistic arctic wolf piece. I love the shading and palette, and the anatomy is just phenomenal. Nice work! If you’re interested in getting your work shown here, don’t be afraid to send us an attachment of your art in an email to support@animaljamarchives.com. Don’t forget to title your email as Masterpiece Monday Submission! Anyways, Jammers, that’ll be it for this week. I’ll see you next time! Hello there! I’m King, and today I’ll be showcasing four awesome pieces today. Les get started, shall we? I adore this Warrior Cats inspired piece by gubec! The lineart is phenomenal, and the flowing fur and loving really takes the cake here. Splovacatopancakes has made this awesome arctic fox artwork! The style is amazing, and I love the text! Overall, this is a very well done piece. Our third piece by Violin109 is amazing! The outline makes the wolf pop, and the colored lines give the piece another dimension. Finally, we have gaid5’s awesomely adorable artwork. I love the color palette, and the anatomy is great! If you’d like your piece shown here, don’t be afraid to email it to us via support@animaljamarchives.com with the title of Masterpiece Monday Submission. Thanks for submitting! Anyways, that’s all for today. Farewell, and have an amazing week! Hello there! I’m KingJamaa, and today I’ll be bringing you the thirteenth edition of Masterpiece Monday. How about we get started? phantomnews/phantomwarden has created the first masterpiece I’ll be showcasing today. I love the smoothness of the writing and straightness of the lines, and the color palette is gorgeous and really looks like a newspaper. Arrowthewolfy’s Pokémon piece is one I fell in love with. The scenery and color palette are phenomenal, and I adore the shading style. Thirdly, we have Apoløgize’s realistic wolf piece. I love the unique blending style, and the detail is awesome. In addition, I love the background! Finally, we have Nymphaeaalba’s forest scenery piece. I love the attention to detail, and the colors are so pleasing. To add on, the perspective is amazing! Well, that’ll be it from me. But, wait- if you would like to submit your work to be shown here, send us an email at support@animaljamarchives.com with the subject line Masterpiece Monday Submission. Thanks, and farewell! Have a nice day. Salutations, everyone! The name’s King and I’m more than pleased to be your host for today. We have four amazing pieces to view this fine day, so let’s jump right into it. Nymphaeaalba’s flower piece really caught my attention while looking through masterpieces. The lettering is gorgeous, and the shape of the plant isn’t stunning and overall amazing. Secondly is Taeteaa’s artwork of an anime-type girl. The way you draw her was amazing, and the black lineart takes piece to a whole new level. In addition, the colors are bright and stand out against each other. Next up is Teddiboo’s phenomenal piece of a canine laying down sideways, face towards the sky. I love the interpretation of the pose, and the background makes the wolf stand out. To add on, the text was an awesome addition! Last but not least is boop32’s desert/snake masterpiece. I love the AJ style, and the pet looks just like the real model. Finally, the background is such an awesome add-on. If you’ve ever wanted your artwork showcased here, it’d be appreciated if you could email support@animaljamarchives.com your work and add the subject line Masterpiece Monday Submission. Thanks! Anyways, that’ll be it. Have an awesome day!! Salutations, jammers! My name is KingJamaa, and I welcome you to a very special and patriotic edition of Masterpiece Monday! Today, we’ll be showcasing two freedom day themed masterpieces found under the #AJfreedom tag on Instagram. Let’s get started with the art, shall we? Our first masterpiece is drawn by @starry.silhouette.aj and depicts a wolf staring at some colorful fireworks. I love the colors on the piece, and the pose is very well done. In addition, the shading is phenomenal, as well as the small details. Finally, @cupcakecelineaj’s freedom theme park piece is phenomenal! I adore the reflections in the water, as well as the rabbit! The lighting and blending are additionally excellent, what an excellent job. If you have any masterpieces you’d like to share, please send the, to me via Google Hangouts or Animal Jam Amino! (You can find me on both platforms by searching KingJamaa.) I take all submissions into consideration, and maybe yours will pop up here one week! With that, that’ll be it from me. Have a great evening, and a happy freedom day! Greetings, jammer! My name is KingJamaa, and I’m your host for this week’s edition of Masterpiece Monday. Today, we have four amazing masterpieces to showcase, so let’s get started. Our first masterpiece, made by Blackwolf507, showcases a snake curled on a branch. I adore the many different shades of green used, as well as the small touches of yellow that dot the snake itself as well as the background. Sharktag3489 has created a realistic bust shot of Julian2! The text really stood out to me, and the curls of Julian’s mane and tail really take the cake for me. In addition, the monocle and sword are very well drawn. Lovely job~! Filing up for our third piece this week is Jammer001371’s underwater landscape scene. The hues of blue make for a very detailed piece, and the jellyfish and shark are exceptionally well done. Finally, we have Cengizhan541’s representation of none other than Wisteriamoon. This artist’s style is very detailed, and I absolutely love the candle croc in the corner. The shading is additionally pleasing, and everything about this piece really flows together in my opinion. Well jammers, that’ll be it from me for this week. Ciao, and see you in Jamaa! Greetings, jammers! Welcome to Masterpiece Monday, the latest new topic on AJA. Every Monday, along with the Rare Item Monday post, a Masterpiece Monday will be posted with three to four awesome masterpieces I’ve found around Jamaa with some constructive critique and compliments. Let’s get started, shall we? Our first masterpiece is by Nifkit, and it depicts several different phantoms in a land of what seems to be filled with purple landscape. I personally love this jammer’s use of shading, as well as the perspective and depth. The different features on the phantoms are also phenomenal, such as the spikes and what looks to be an angry-looking eyebrow. Pizzaplaza’s gorgeous mountain portrait takes the stage for our second masterpiece this week. The different colors really pop out, and the blending of the reflection of the mountain in the river is stunning. In addition, the two peaks in the background really show the boundary between the larger mountain and the many seemingly smaller mountains. Lovely job, jammer! Snagging the third slot for our time this article is a beautiful polar bear masterpiece by none other than Cleopawtrah! I adore how this jammer has shaded the piece, and the colors they’ve managed to achieve within AJ’s art studio really takes the cake for me. The snowflakes are, additionally, very well drawn– they really help structure the setting! 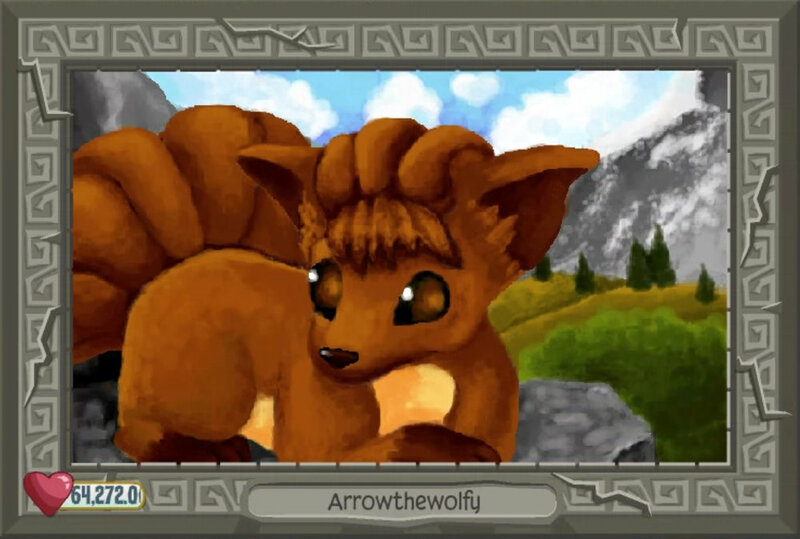 Our final masterpiece is one drawn by Theshopking that depicts Animal Jam’s logo. I love the gradients and dark purple background that really makes the logo pop. The lines are very straight, and it resembles the game’s logo a lot in my opinion. Well, jammers, that concludes our session for this week. Thanks for reading, and have a great day!